Zesium is one of the leading companies in Serbia, not just in mobile development, but also in Java, C++, and.NET technologies. With experienced developers in this field, many partners have chosen us as their partner whilst looking for productive teams of experts who can deal with the pressure of large projects and who can successfully deliver them on time. Our company has been involved in various industries and we have a special bond with agriculture where we successfully implemented applications that we are the most proud of. The delivered quality and our partners’ references were the sign that we are a partner to be trusted for large projects and challenges – with the background and experience in Lean management methods as well as the methods of analysis of Life-cycle of production and service processes, we were able to offer a new concept for John Deere workflow which promised incredible result for the business. During the briefing time about the product, Zesium team showed knowledge substantiated with new ideas for expanding their business plan. JD is a system developed for John Deere Serbia and consists of 3 main parts. The 1st part is an Android application whose main purpose is to help farmers report any kind of malfunction of their tractors, harvesters etc. Prior to the application, farmers could report such problems only via phone and it usually took time due to a lack of service coverage organization and long logistic procedures. Through the application, with only 2 clicks, farmers are able to contact their John Deere service whose operators have all the information about their product – that way the communication became faster and easier. Moreover, the app helps operators to be directed to the farmers only in their region whilst in the recent past, they could be referred to any farmer anywhere in Serbia. This way, the operator’s response rate became higher on critical events regarding mechanical failures and more transparent, while the organization process became more efficient, reliable and faster. The application became very important, as farmers are able to get in touch with service officers quickly and to get specific replies to their issues easily through the application on their mobile phones. 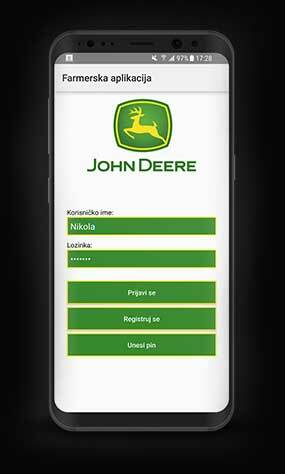 The app sends notifications to the service in charge for a specific region so they can respond to farmers’ problems instantly, it helps both farmers and the service to communicate in easier, cheaper, and more efficient way; it also notifies farmers about the events regarding agriculture, machinery and new products from John Deere which many farmers found very useful for their business. The 2nd part is related to the Service application which helps John Deere’s management to monitor all malfunctions of their machines and to get feedback regarding the same. Service app keeps track of the problems reported, can recognize which type of machines have identical failures, what are complains about and thus improve and report to the production management. The service is able to check the warranty period of the machine reported by the farmer, as well as to make further analysis of their products. 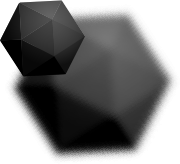 The design was developed by Zesium, both graphical (colors, icons, etc) and functional (UX, screens, buttons, etc). It was adjusted to be easy to use but at the same time, inventive and modern. We are deeply proud of JD application developed for Serbian farmers since nothing similar was developed as a solution before in John Deere business process. 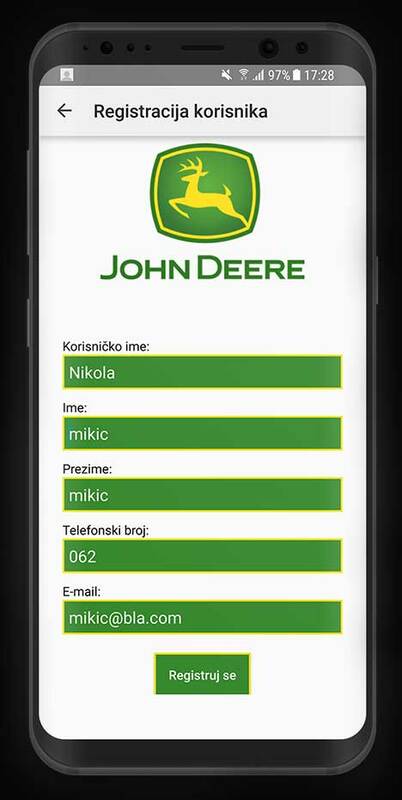 As John Deere is a global network operating in more than 30 countries, the application will further expand to other markets as it has shown excellent results and encouraging feedback from both – users (farmers) and the management of John Deere company in Serbia. JD application was a complex development process which involved both farmers and the internal part of John Deere – the importance of good feedback from both sides regarding the application was essential for Zesium. great application, admiration for the great idea and its realization. Everyone from our company who was interacting with workers from Zesium, were more than satisfied with their dedication to work and their quality of services provided to us. In general, people who we worked with on a daily basis were very fast in implementing our ideas into an app and also they were dealing really good with any problems that we were encountering during the process of building an app. All in all, we were very pleased and content with working with Zesium, because their team is really flexible and easy to work with and what is most important in IT industry – they were open to new ideas and innovation. As they would say in John Deere: ‘In the race against the time, nothing runs like a deer’.